Applitools has developed the first cloud-based software testing tool that automatically validates all the visual aspects of any Web, Mobile and Native app like a manual tester does. Applitools automatically validates the correctness of the UI layout, content and appearance, and enables you to automate tests that can only be done manually without it. It can test apps on any browser, device, OS and programming language, on any screen resolution and form-factor. Applitools provides an unprecedented visual failure analysis and test coverage analysis that result in better and faster app release process. 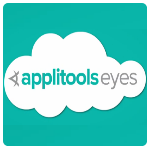 Applitools created an automated UI validation product called Applitools Eyes that uses visual technology to detect differences in how an app looks on different browsers or platforms and replaces hundreds of lines of testing code with a visual scan.The cloud-based platform has1,500 users - including SMBs and startups - who have performed more than 750,000 visual tests. The software can be integrated into other test automation and ALM frameworks such as Selenium, Appium, MS Coded UI, Atlassian, Rally and others. The tests it performs to ensure an app looks the same on all platforms previously could only be carried out by a person actually testing each platform individually.